Welcome to the 328th & 329th edition of the Rantings of the Guild Stalker, your one stop spot to get all the juiciest tidbits. But if you hear it here, you probably didn't hear it first, unless you did--in which case I call Shaman Iguana! Seeing as how my plans for a nice and early newsletter went awry we will call this a combo early next week newsletter as well. And, with that...we are off and running. Well, we are officially in April now (don't even ask me how or when that happened because I swear it was January yesterday). 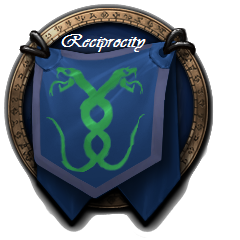 A big warm Reciprocity welcome to our newest guildie: Clozee!! Additionally, I am glad to report that all guildies did in fact survive the air freshener pizza experience. Also, in life news, for those that wished Noinar well I am happy to report he did in fact get that job and despite the not super great communication and a miscommunication over the drug test...Noinar is now officially employed in his new field at a job he (as of day three) really likes. So thanks to everyone for the support over the last several months. First and foremost you gotta know that today--that's right TODAY--is March of the Tadpoles, so if you haven't been I recommend you check it out it is quite amusing. Want to read more about it, check out wowhead's guide to the microholiday. If you like amusing and you totally forgot that April Fool's was a thing...particularly in the Blizzard universe, you can read up on ALL the great tricks you missed here. I have to say I am a little disappointed some of these aren't real. Don't forget the Darkmoon Faire is also back in town starting Sunday this weekend. Remember this can be great for rep grinds, leveling ... and well just plain fun. PLUS, Patch 8.1.5 (this is the first faire since then) added new severed fish head hats, new pets, a rollercoaster and more. Be sure to check it out, or read about it. Cantique was nominated for running ALL of the dungeons. I can't even count the number of mythics she ran last week. Not only did she help people get their weekly quests completed but she also helped us stock up on cauldrons for raid. Thanks for perkily always helping out. "I mean sure, you're naked in a prison with a sketchy pirate, but you're here." There is a battle pet called Vengeful Chicken, which can only be obtained during the Dungeon World Ques: Waycrest Manor: Witchy Kitchen. I know a few guildies who would like to do this, so if you are one of em let Rho know and we will try and set up some groups (or, as always, feel free to grab people from guild chat). World quest will go away at reset Monday morning so you have Friday, Saturday and Sunday (I think) to get your chickens. This is a reminder that we were trying to set up some guild groups to get the Hivemind mount for people. It requires five people for the final attunement. Right now we have three people who have said they are interested (and a few more who said they could help out if needed). If you are interested, please let me know so we can get this fun up and running! Not too much new to report just yet...although we made good progress on Heroic Opulence this week and last and I am hopeful his death is in the near future. As a reminder, April raids are posted, so sign up please!